The app is FREE from the Apple App Store or Google Play Store. Click the links below, or search "JustRide Bustang" to download. You can purchase tickets up to 180 days (6 months) in advance of using them. Note: If you do not have a smart phone, you may also pay your fare with exact cash when boarding the bus. The app is FREE from the Apple App Store or Google Play Store. Click the links below, or search “JustRide Bustang” to download. You can purchase tickets up to 180 days (6 months) in advance of using them. You can now also purchase your tickets in advance online! Purchase through the portal by logging into your account, and your tickets will be delivered to your mobile app. Need to purchase tickets remotely for a friend, family member, or employee? Get their log-in info so you can purchase their tickets for them using the online portal. All tickets are delivered to your phone as “Not Yet Activated.” You must activate your ticket as you are boarding and show it to the driver. Mobile tickets expire 30 minutes after activating. Note: If you do not have a smart phone, you may also pay your fare with exact cash when boarding the bus. See fares below. ONLINE/MOBILE PURCHASES NOT AVAILABLE. PLEASE PAY CASH WHEN BOARDING. All tickets are non-refundable. 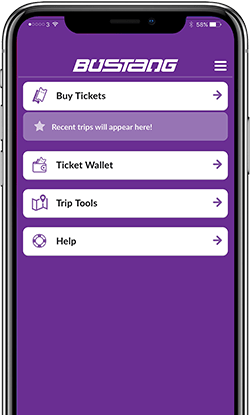 All mobile app tickets are valid for 6 months from purchase date and can be used on any Bustang trip of the same cost within that 6 month period. Once a ticket has been used the designated number of times (whether 1, 10, 20 or 40) the ticket is no longer valid, regardless of the expiration date. All regular tickets, single ride and multiple ride, can be purchased on our mobile app. The On-Board Fare Box only accepts bills up to $20 (does NOT accept $50 or $100 bills). Mobile app tickets expire 30 minutes after activation. Do NOT activate until you are boarding the bus. Multiple Ride tickets are discounted (10 ride, 20 ride, 40 ride). No further discounts are available. Multiple Ride tickets cannot be used for group travel. They are intended for frequent riders. Children ages 2 – 11 receive a 50% Discount. Children must be accompanied by an adult 18 or over. Children 15 years and under must be accompanied by an adult 18 or over. RamsRoute tickets, Bustang to Broncos tickets, and regular Bustang tickets are NOT interchangeable. Regular Bustang tickets will not be accepted on RamsRoute or Bustang to Broncos, as these are reservation-only services.